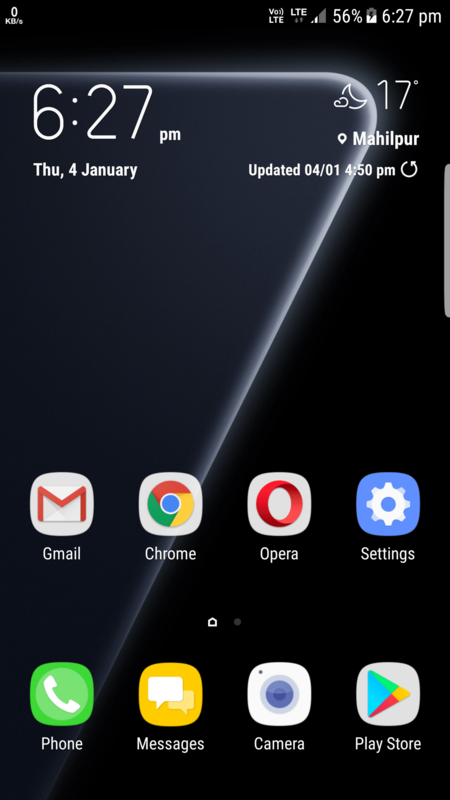 Samsung is all set to close the Oreo beta testing for the Galaxy S8 and S8+ units on January 15th and is expected to roll-out the stable Oreo update to the units this month. The Korean company is also expected to rollout the Oreo update to the Galaxy Note 8 units as well followed by other Galaxy S series and other mid-range devices this year. 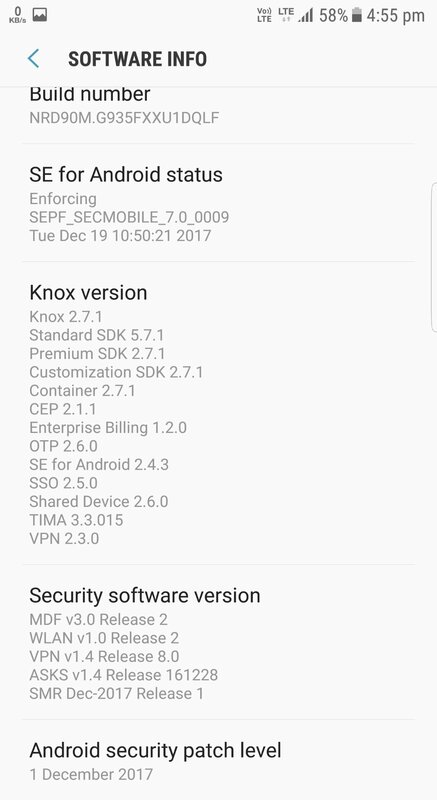 The exact date of the Oreo rollout for the 2016 flagships Galaxy S7 and S7 Edge is still not known but the company has finally started rolling the December security update to the Galaxy S7 Edge units in India that also comes with some more new updates inside the system. 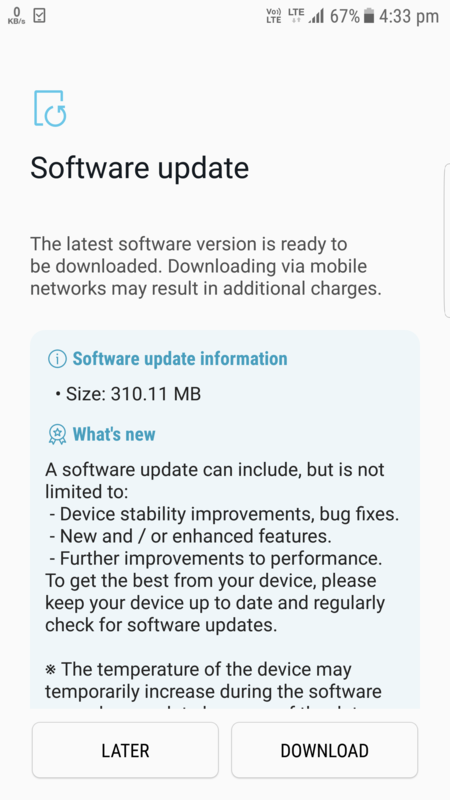 The new update comes with a size of 310.11MB and bumps up the build number of the device to XXU1DQLF. The new December security patch update also brings an update to the weather app that now comes with new font style. 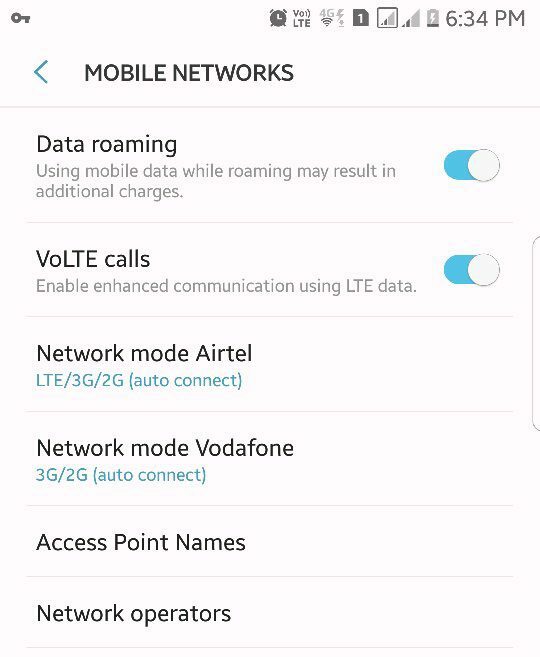 This update has also added a new settings for VoLTE calls in the mobile networks menu in settings. The update comes with bug fixes and enhancements and nothing else new. To recall, the Galaxy S7 Edge was launched with a 5.5-inch QHD Super AMOLED display and is powered by Samsung’s octa-core Exynos 8890 SoC. It has 4GB of RAM and 32GB inbuilt storage capacity with up to 256GB expandable MicroSD card storage with the help of Hybrid Dual SIM. The Galaxy S7 Edge features a 12-megapixel Dual Pixel rear camera with f/1.7 aperture, smart OIS and a 5-megapixel front camera with f/1.7 aperture. It runs Android 6.0 Marshmallow OS and comes with IP68 rating for dust and water resistance. It is backed up by a 3600mAh battery. The Galaxy S8 comes with a 5.8-inch QHD+ Super AMOLED Infinity display with 1440×2960 pixels resolution, octa-core Qualcomm Snapdragon 835 with Adreno 540 GPU or octa-core Samsung Exynos 9 Series 8895 processor with Mali-G71 MP20 GPU, 4GB of LPDDR4 RAM, 64GB inbuilt storage, MicroSD card expandable storage with up to 256GB storage, Android 7.0 (Nougat) OS, dual-SIM, a 12-megapixel Dual Pixel rear camera with LED Flash, f/1.7 aperture. Other options includes an 8-megapixel auto focus front-facing camera with f/1.7 aperture, a 3000mAh battery with wireless charging and fast charging support, connectivity options like 4G VoLTE, Wi-Fi 802.11ac (2.4/5GHz), VHT80 MU-MIMO, Bluetooth v 5.0 (LE up to 2Mbps), GPS with GLONASS, USB 2.0, MST and NFC. It measures 148.9 x 68.1 x 8.0 mm and weights 155 grams. The Galaxy S8 comes with IP68 certification for water and dust resistance. A fingerprint scanner is available on the rear side.